My name is Will Powell and I'm the Sr. Manager of Operations at AppArmor. I'll be doing a number of blog posts relating to interesting and powerful uses of various AppArmor products; we're calling it the "Focus on a Feature" series. 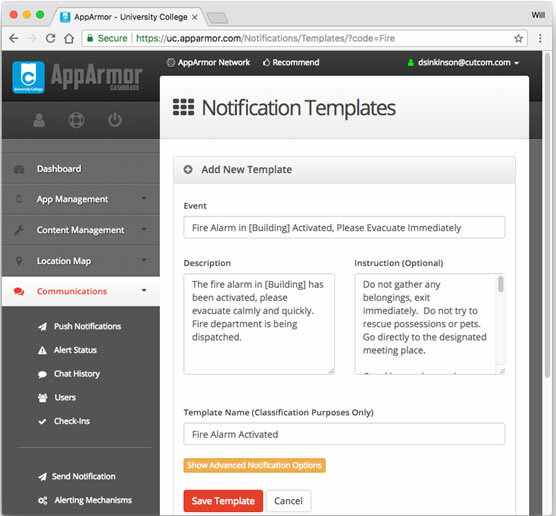 In our first post of the series, I'm going to focus on AppArmor Alert - AppArmor’s Unified Mass Notification platform. Our system was built from the ground up with Common Alerting Protocol (CAP) in mind. This article introduces you to CAP, and explains how you can use AppArmor Alert to send notifications that comply with this format. CAP is the standard data format for sending emergency notifications. It was developed from 2001-2003 based on the need for a standardized format that could be used across multiple systems. CAP is managed by the Organization for the Advancement of Structured Information Standards (OASIS). You can find their official CAP documentation here. 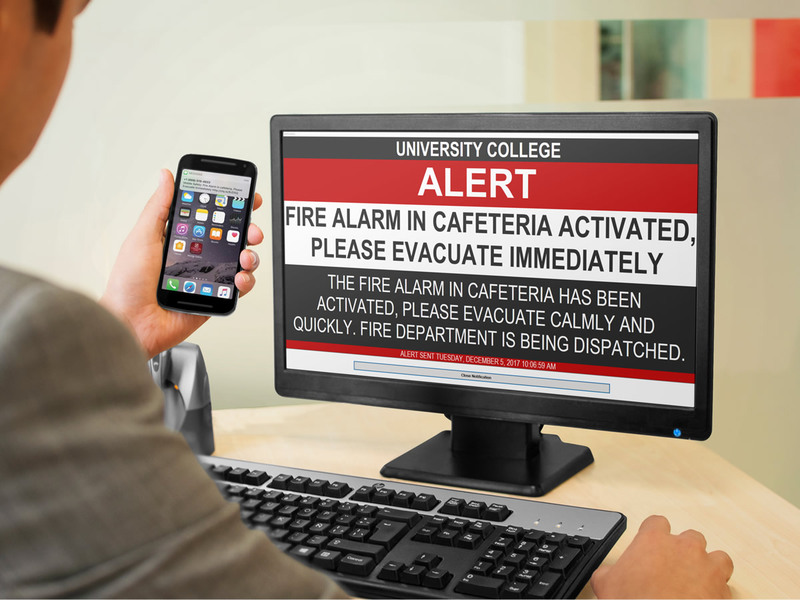 The AppArmor Alert Unified Mass Notification platform was built to meet CAP standards. 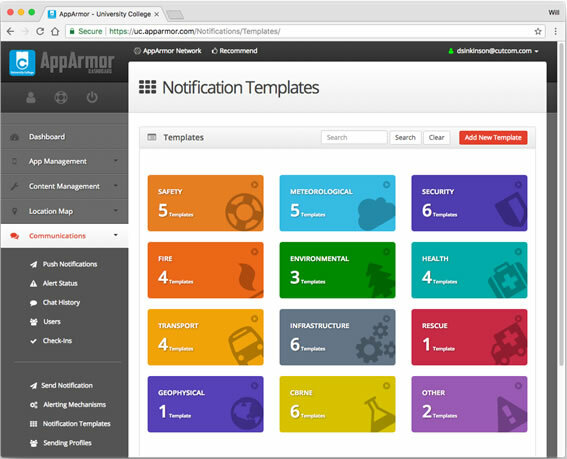 CAP compliant Templates can be easily created in the AppArmor Dashboard with our user-friendly template editor. You’ll fill out 8 CAP fields to ensure that your message can be re-broadcast by other local authorities, in addition to effectively alerting your users. You’ll also use “variable fields” that will be filled out when sending a notification, allowing your sender to easily customize the message on the fly. Your templates are organized in the Dashboard by CAP category. When you send a notification, AppArmor reads the CAP data that you’ve created, and uses it to populate a notification to your end users. These notifications can come in the form of Push Notifications, Alert Status, SMS text message, Email, Voice Calling, Desktop Notifications, RSS feeds and Website Activation. The most important information (the “Event” CAP field) is highlighted in the initial notification, and users can click a link to see all of the CAP fields that you populated when you created the template. When you sign up for AppArmor Alert, we provide you with 50 pre-built CAP compliant templates for you to use as you see fit. You can use the out-of-box templates, modify them to your liking, or replace some or all of them with your institution’s own content. Contact your AppArmor representative to learn about how you can start using AppArmor Alert to send CAP compliant notifications to your users today. I hope you enjoyed this post! Stay tuned for more from the "Focus on a Feature" series!